Conservatives got their wish. The media is reporting on Democratic Sen. Bob Menendez's (NJ) corruption trial. The bad news? They've managed to find a positive spin on it. 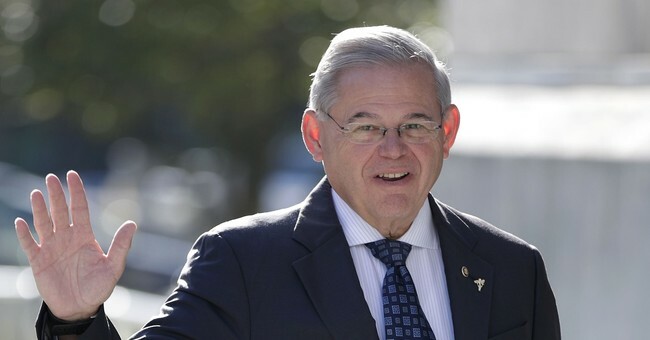 While the AP didn't bury the lede in their report - that Menendez is on trial for accepting donations from an eye doctor in exchange for lobbying on his behalf - they spent much more time highlighting how the senator is making use of a bad situation. Though he is not able to vote in the Senate during the trial, he is nonetheless attending DACA protests, and sending press releases and tweets on behalf of the Democratic Party. This "flurry" of activity, according to the AP, proves that Menendez may be stuck in a courtroom, but is not entirely keeping him from Senate work. The AP went on to discuss Menendez's "spirited" defense team and advisors who are helping him fight for his vindication. “He has chosen to continue his fight for New Jersey while at the same time fighting to clear his good name, when most people under these conditions would’ve simply collapsed,” senior political adviser Mike Soliman said. He continues to work on Democrats' behalf because he believes he'll be acquitted, the AP suggests. Menendez may be attending rallies, but his absence in Congress is going to be costly for Democrats, White House Counsel Kellyanne Conway predicted. After all, September is a busy month for legislation. As always, Twitter had the best response.